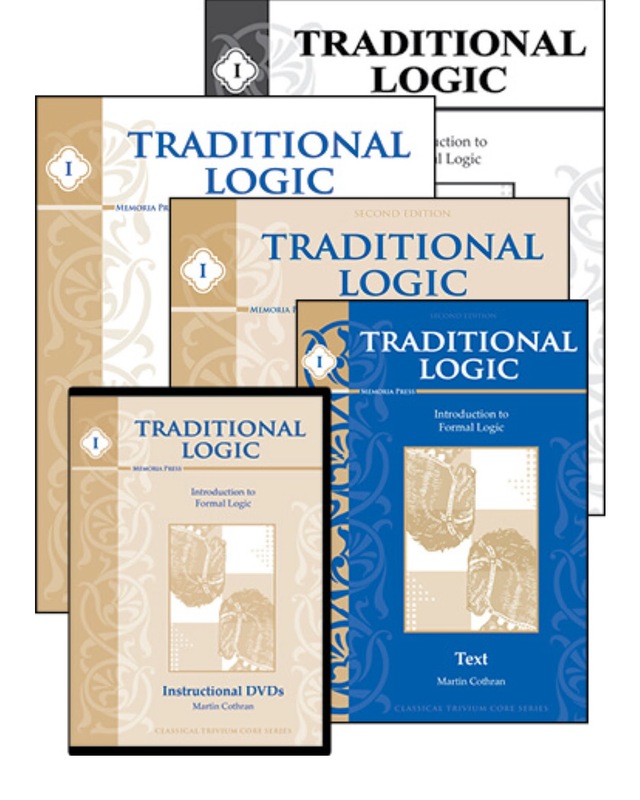 The following is a review of Traditional Logic from Memoria Press with the TOS Homeschool Review Crew. For this review, we received both Traditional Logic I Complete Set and Traditional Logic II Complete Set. For each set we received their instructional DVD, student text, teacher key, and consumable student workbook and test book. A day by day teaching schedule and lesson plans are available for purchase on their website. We started these logic lessons by watching the DVD which is conveniently organized by lesson which corresponds with the student workbook. Latin is built into the lessons, and the dvd clearly covers that including both definitions and proper pronunciation. While the text book does cover the material, the heart of the lessons is the video lecture in which the author explains the material. Each chapter in the book included an introduction of the new material, further explanation of different types or categories that fall under the main heading, and a summary. Chapters in Traditional Logic I cover simple apprehension, judgment, and deductive inference. There is a helpful glossary and page of “helpful people to remember in that book. 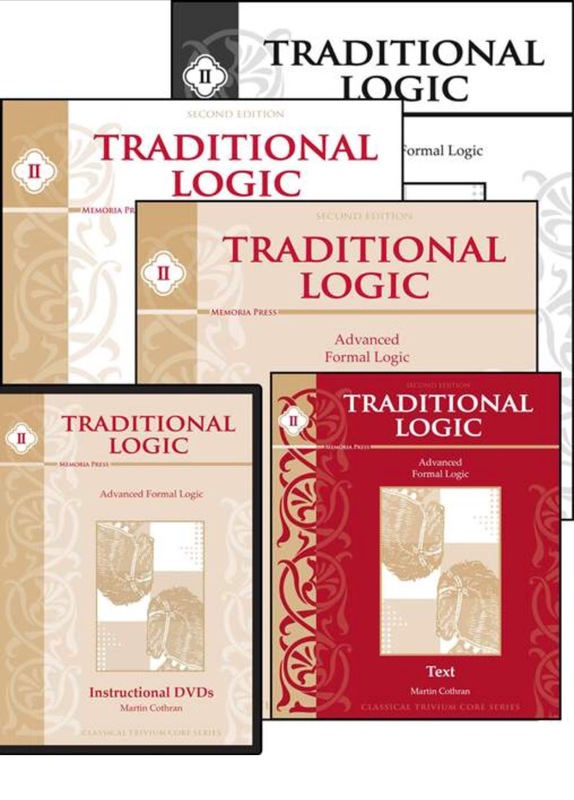 The Traditional Logic II book goes into more depth with multiple types of syllogisms, language including enthymemes, and the logic of relations. Many of these words were completely new to me which made me appreciate the video lessons even more. The workbook lessons were easy to understand. One of the first things that I read in was an explanation of the difference in teaching traditional logic versus modern logic and formal versus informal logic. “Traditional logic trains the mind to respect truth, and indeed assumes a Christian view of truth throughout, which is one of the reasons it appealed to the Medieval schoolmen.” The author further explains that it teaches that there is absolute truth and that it can be comprehended. The Teacher Keys are both basically answer books. They provide the questions and answers for the workbooks, quizzes, and tests but not instructions for the teacher. . There is a “note to the teacher” in the front of each text book. 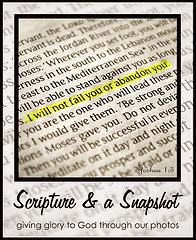 The workbook lessons are broken down into weekly sections and then daily lessons. 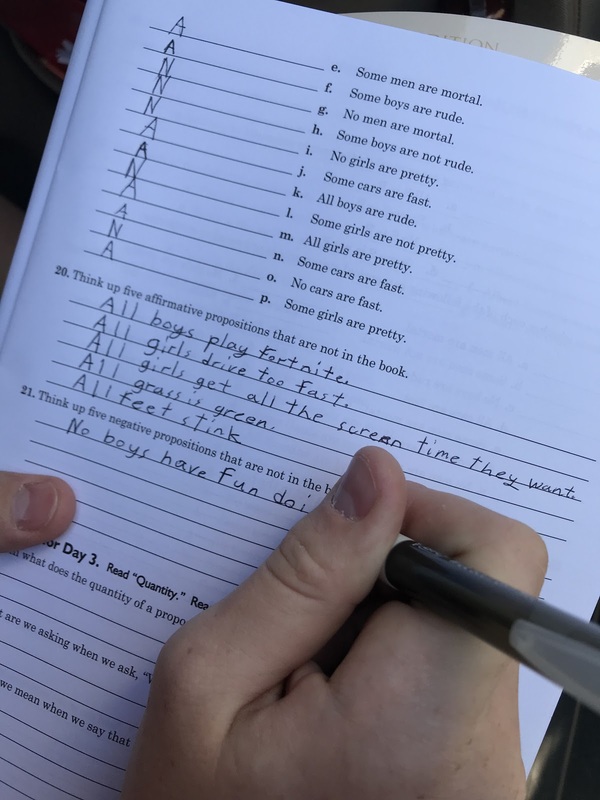 Most questions require a combination of fill in the blank and sentence responses, but essays are required at the end of the Advanced Formal Logic workbook. The Advanced Formal Logic lessons add another 14 chapters and provide the second half of a complete high school logic credit. 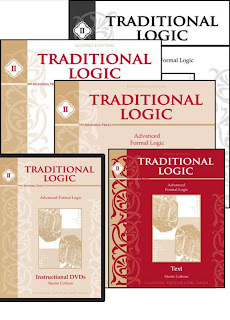 If used, it is recommended to complete Traditional Logic I in less than a semester and using the remaining time for Traditional Logic II. That quote from the Advanced Formal Logic workbook sort of sums up the lessons. The students are taught methods of analyzing statements which help determine the validity of arguments. I hope that upon completion of these lessons my son will be able to do just that. Being able to not only speak clearly but to share rational thoughts and be able to know when facts presented are not rational is an important life skill. This series of books cover logic in a more complex yet in depth way that helps students interpret facts presented to them. I absolutely see the value in these two courses and plan to continue using them with my son. Visit Memoria Press on Facebook, Twitter, Pinterest, Google+, You Tube, and Instagram, and be sure to tell them hi from Jennifer at A Glimpse of Our Life.